The centuries-long rashes of witch-hunts that swept through Europe before infamously culminating in America’s Salem Witch Trials have cast an almost equally long shadow over the arts, inspiring everything from high-minded literary allegories to vomitous barf bag-fillers. Falling in between these two poles is City of the Dead, an overlooked British production that’s both a prelude to the era’s looming occult Eurohorror offerings and every bit as essential as the films that came to define that era. While the likes of Bava, Amicus, Hammer, and Tigon are the first names that roll of one’s tongue in this arena, John Llewelyn Moxey’s stunning debut deserves a spot in that same company, as few films reach its eerie, atmospheric heights. Rarely has a fog machine and a well-dressed backlot conspired to produce such a chilling, claustrophobic piece of work that thrives on pure, sinister mood. A staggering prologue sends us back to 17th century New England, where the mass hysteria has reached a boil in Whitewood, Massachusetts. Local woman Elizabeth Selwyn (Patricia Jessel) has been accused of witchcraft and finds herself tied to a stake, flames licking up around her as the bloodthirsty mob looks on with a mixture of horror and appeasement. Before the flames engulf her, Selwyn reveals that her pact with the devil will allow her to haunt the town and curse its inhabitants forever. A quick—if not jarring cutaway—soon flashes us ahead a few centuries, as we learn this sordid tale has been part of Professor Alan Driscoll’s (Christopher Lee) lecture to a group of enraptured students. One student, Nan Barlow (Venetia Stevenson), is particularly intrigued by the story, so much so that she visits Whitewood at Driscoll’s suggestion. Despite all the clear warning signs—including the ominous words of a gas station owner on the way and the presence of a phantasmagoric hitchhiker—she presses on in her research of the town’s grisly lore, unwittingly uncovering an unholy conspiracy in the process. Absolutely drenched in gothic atmosphere, City of the Dead unfolds with the very specific dread of a waking dream. Whitewood is less a town and more an unreal enclave of some perpetually midnight phantom zone. Complete darkness shrouds this obviously artificial backlot, heightening its surreal sense of claustrophobia. As Nan burrows deeper into its history, there’s a sense that its walls are closing in around her, threatening to entrap her for good in this otherworldly fantasia of derelict churches, shadowy graveyards, and unsettling black magic. Fog smothers every corner, seemingly seeping from the earth like some kind of dispatch from hell, diffusing throughout nearly every frame. At a certain point, you’re convinced fog will be begin flowing right into your living room, drawing you further into Whitewood’s subtle, almost sleepy menace. Thumbing through the town’s sordid past alongside Nan brings us the creeping realization that this place is somehow crystallized in and out of time, what with its ancient hotel whose amenities include a trapdoor leading down to a dungeon crawling in cobwebs and torches. Whitewood is the clear centerpiece here: a remarkable display of gothic set design, it (perhaps purposefully) threatens to swallow up much of the cast, reducing them to pawns in a sinister ritual. Something about this works, though, at least historically speaking: these characters—while certainly quite thin and largely disposable—feel like the sort of wide-eyed youngsters that would have been battling giant insects or alien blobs in matinee creepshows just a few years earlier. Supporting Nan from afar are her skeptical but do-gooder brother and a square-jawed boyfriend, both positioned to obviously swoop in and save the day once this girl finds herself thrashing in the occult deep end. Stevenson is the ideal for this stock damsel-in-distress role: doe-eyed but dogged, charged with a luminous sort of innocence and purity that simply can’t be sullied or assaulted because that sort of thing just doesn’t happen to these nice, proto-final girls in horror movies. Except, of course, when it does, making the turn of events here all the more shocking when Nan finds herself tied to a slab, surrounded by an honest-to-god coven of witches on Candlemas Eve. Emerging from the shadows is her once kindly professor, now shrouded in some sort of robe, glaring ominously as the once unassuming hotel owner (also Jessel) draws a dagger and promptly stabs Nan. While it’s not as overtly graphic as the pivotal scene in Psycho (which was hitting U.S. theaters around the same time this one arrived in British movie houses in an interesting bit of synchronicity), it functions in the same manner, sending a jolt through a content audience and completely upending the picture. Suddenly, City of the Dead isn’t some quaint trip into the unknown; instead, it morphs into a procedural where Nan’s brother and boyfriend mount what they believe to be a rescue mission. In truth, they aren’t completely wrong since their arrival coincides with the Witch’s Sabbath, which marks the year’s second sacrifice, and Whitewood’s coven has already marked another interloper—this time the caretaker of the town’s bookstore—for death. And so, the audience is treated to another descent into hell, only this time with the veil completely lifted. Not that Whitewood’s intentions were ever exactly murky, mind you—it’s just that the second go-round is even more deliriously unhinged, if not playful. With the Sabbath approaching and one virgin sacrifice completed, the coven grows more bold, including the eternal Elizabeth Selwyn herself. When masquerading as a kindly hotel operator with Nan, she operates with a certain genteel curtness that melts away during the second half of the film, when she becomes more menacing in her interactions with everyone—including a poor maid looking to reveal the truth about what lurks in the bowels of the hotel. Lee’s Professor Driscoll also comes this close to dropping his act altogether: we watch him performing his own demented animal sacrifices at home before he’s interrupted by a visit from Nan’s brother and boyfriend. He can barely conceal his disdain for these two, and Lee only comes to revel in this devilish role, the likes of which would come to define his career. Here, it’s contrasted by the kindly front that we’re prone to distrusting decades later; in 1960, however, I imagine the effect would have been somewhat more jarring since he hadn’t quite cemented his legacy as a recurring horror baddie just yet. City of the Dead should have gone a long way in doing just that, however. Again, it’s not the sort of film that usually reaches the upper echelon in conversation alongside Lee’s other, more notable roles—though I would certainly argue that it should, if only because it represents a stark departure for the genre. Like Psycho, it’s perched at a crossroads of eras: though its aesthetic and premise are the stuff of old-fashioned gothic horror, its underlying mean streak points to the sinister nihilism lurking in the genre’s future. Arguably, the juxtaposition is even more pronounced here than it is in Hitchcock’s film since Moxley and company do capture that sort of pulpy matinee feel but shade it every step of the way with gritty violence and shocking, uncompromising story developments. 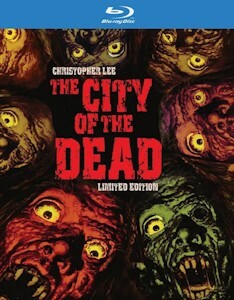 Eventually, the former does win out a bit: City of the Dead is still the sort of breezy, 78-minute film that climaxes with the fiery, gory bombast typical of Hammer’s popular offerings (and this is not to mention its effectively incongruent score, an odd pastiche of Douglas Gamley's stock horror strains with Ken Jones's jazz improvisations that accents the film's devious playfulness). However, there’s also no denying how genuinely mean and sinister its black heart is, making it very much the spiritual predecessor its producers’ later works. Amicus Productions wouldn’t be officially founded for a couple of years, but the collaboration here between Max Rosenberg and Milton Subotsky would mark the beginning of a prolific working relationship that would yield some of the best horror films of all-time, many of which would this film blending of classical gothic chills with a genuine nasty streak. Far from a curious footnote, however, City of the Dead deserves an stature based on its own merit, as Moxley’s strain of occult horror is tangibly eerie, its gothic credentials as thick as the fog that spreads throughout Whitewood. Despite being set in the dead of winter, this is the filmic equivalent of a scented candle that captures October and Halloween: it’s the stuff of black cats and goblins, of broomsticks and ghosts, of covens and witches and all of their hosts. One has to wonder if City of the Dead hasn’t earned its deserved reputation because it’s been haunting public domain budget packs for years, save for the occasional legitimate release from VCI. Even though there’s gold to be mined from such hills—with City of the Dead itself proving as much—such a fate does tend to lead to misperceptions. At any rate, VCI has once again taken an effort to further legitimize this one with another limited edition Blu-ray release, this one arriving two years after the last high-def outing. This one sports a new 2K restoration that looks quite solid, as the evocative black-and-white photography is preserved with strong contrasts and shadow detail. I don’t know that it’s reference quality, nor can I speak of it as an improvement over the previous disc, though it looks like the consensus elsewhere is very much in favor of this release. It should be noted that there’s some discrepancy over the aspect ratio: this disc presents the film in 1.78:1 instead of the original 1:66:1, which might be a sticking point for purists (in which case, you should spring for the Arrow Video release if you’re region-free). What I can say is that it’s scarce on supplements compared to other releases. Both Arrow’s recent release and VCI’s older offerings sport much more than what’s found here, which amount to a theatrical trailer, a 45-minute interview with Christopher Lee (ported over from VCI’s original DVD), plus a commentary with the legendary actor. On the other hand, previous editions have boasted multiple cuts of the film (this one only features the original British version), plus numerous extras, so if you’re in search of a more exhaustive release, this one’s not really suitable. If, however, you’re looking for a reasonable entry point for this film, this is definitely a serviceable enough release—even if I’m also not too keen on how VCI colorized the original poster art, which creates a needlessly garish impression of an otherwise elegant, evocative gothic horror movie that’s become one of my staples in recent years, so much so that one of its other posters has been hanging on my wall since I first it just under a decade ago. In fact, I would go so far as to put City of the Dead on a very short list of favorite discoveries during the past ten years of writing for this site, ranking alongside the likes of Curse of the Cat People and Night of the Demon (1980—yes, I contain multitudes and all that jazz). Between this newly issued release and the other recent love thrown in its direction, City of the Dead is certainly due for some kind of reappraisal, at which point it will hopefully be recognized as the vital Eurohorror forerunner that it is.